How does Inferum ABP 051 work and how is it used? 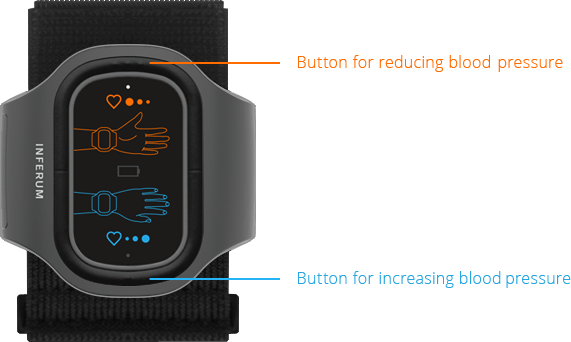 The inbuild electrostimulative electrodes act on the biologically active zones of the wrist. Notice: The shown device is the INFERUM NBP 050. 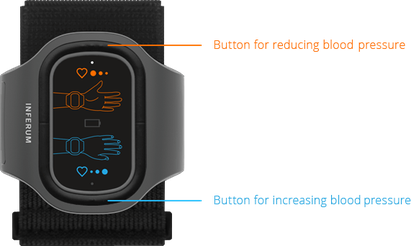 The visual appearance of the INFERUM ABP 051 is similar and the handlingis equal but the programs in running the device are different..
Electrical stimulation occurs using a weak electric current and is barely perceivable. The device uses programs which differ from each other in terms of frequency (from 4 to 140 Hz), time shift and amplitude. Selection of a particular program results either in reduction of sympathicotonia, which leads to hypertension, or in contrast increases the insufficient impact of the smpathetic nervous system on vascular tone, which leads to hypotension. MC6 – zone for reducing arterial blood pressure. Located on the inner side of the left forarm. Stimulating these zones has a significant sedative effect on the cardiovascular system. The device is used for cardiovascular diseases, arterial hypertonia, vegetative-vascular dystonia with fluctuations in blood pressure neurosis and sleep disorders. One session should take 5 minutes. Remove any watches or bracelets from your left arm, roll up your sleeve, attach the device and press the button for reducing blood pressure. After the session is over, it is important to sit or lie down somewhere quiet and relax. Once session is over, relax for 20 minutes. We recommand repeating sessions 1 - 3 times per day over a 14-day period. TE5 – zone for increasing arterial blood pressure. Locared on the outside of the left forearm. One session should take 6 minutes. Remove any watches or bracelets from your left arm, roll up your sleeve, attach the device and press the button for reducing blood pressure. After the session is over, it is important to sit or lie down somewhere quiet and relax. Once session is over, relax for 20 minutes. We recommand repeating sessions 1 - 3 times per day over a 14-day period. A video in Russian language with English subtitles. The usage is shown very impressive.